Storage buildings along waterways need to be well built and durable. With valuable boats and equipment, you need a boat storage building that provides the structural integrity required around water. ClearSpan marine storage buildings are the durable solution needed in the marine industry, and they also provide a unique design that maximizes usable space and convenience. ClearSpan buildings feature plenty of vertical space and have no internal support posts, so there is maximum storage space and the ability to operate machinery and equipment within the structure. Our buildings also feature natural ventilation, reducing moisture and condensation and the damage it can create. There’s no need to worry about boat storage structures when you work with ClearSpan. Our designs can be tailored to any boating application, and the structural integrity that ClearSpan is known for provides peace of mind. "The snow slides right off the top of the building easily." 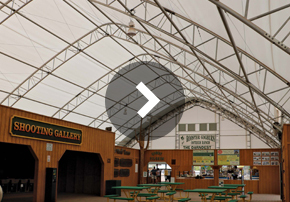 After discovering ClearSpan in one of their affiliate company’s catalogs, Yenney decided that the structures were worth looking into. “Fred Yenney Jr., the owner of our company, personally visited ClearSpan’s manufacturing facility and was very impressed with the Hercules Truss Arch Building,” said Yenney. 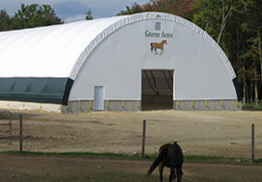 He decided that this type of ClearSpan structure would be the perfect solution for his company. Our marine storage buildings come in fabric, hybrid and metal buildings, ensuring that no matter how you plan on using your ClearSpan structure, there is an ideal option.